Here’s a screenshot of Audacity and below that is a screencast explaining how to use Audacity to record audio. 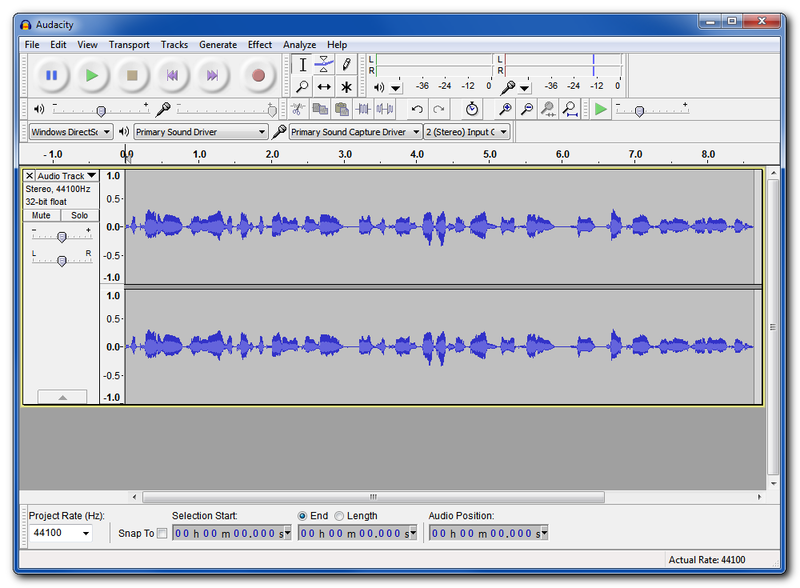 Audacity is a great tool for recording audio, whether it be a product or a podcast. Whenever you want to record some audio. You might even just be reading an eBook that you’ve written, Audacity is the perfect tool. It’s free, it’s cross-platform and you can download it from audacity.sourceforge.net. You can read through the manual, the wiki, they’ve got a forum and some quick help. I’m just going to show you the quick guide to making a recording. So, as we record, I just hit record here and there’s a test recording that comes right out. Just a few things to note. This is the waveform, so if it’s very small, it might mean that your volume might not be up. I have mine fully up, but you might want to take a look at that. This is the microphone volume, this is the output volume and then over here is the playback speed so if you want to sound like the Chipmunks you can crank that baby up. And then up here you noticed as I was recording it showed the levels. You don’t want the levels to be way up here. If they turn red that means you’re capping out and there’s going to be some distortion. So you want to keep it down low. I could probably speak a little bit louder, but anyway, these are just little details. Another common problem people have is when they go to record another one, they hit record and start recording, and then you’ve got problems. So you’ve got this top recording that’s playing back as you’re recording the next one and that’s not at all what you want. So the quick tip for the day is to hold down the Shift key. You’ll see that it has that little note there, Shift-R. You can hit the R to record if you’ve like as well. But holding down the shift key, and then hit record, that actually adds the recording. And you don’t have to hold the Shift key down the whole time. Just when you press it. So you just hold down Shift, record and then add in your recording. Now once you’ve got a recording pretty well done, you’ll notice some dead spaces here. And you might want to take things out if you make a mistake when you’re speaking or if you have some “umhs” or “ahs” you want to remove. The easiest way to do that is to simply select that portion of the audio and hit Delete. You can also zoom in and out if you hold the Control key and scroll in, that zooms in way close or you can zoom out and see the whole thing. You can also go up to the View and Fit to Window and that’s Control+F and that’s a useful way to see the entire recording at once. And then once you’ve cleaned up the audio, you’ve got the end and beginning silences removed, we can go over here to Export. And that’s how we’re going to get it to the MP3. That’s the typical format we use. And going to an MP3 just lets you add in so you could put in information about the track. Maybe track number 1, put in the year. You can fill in the album and track title if you’d like. This is just the metadata that will show up in someone’s MP3 player as they’re listening to your audio. And this is a one time thing that you’ll need to do in order to set up the encoding of an MP3. It’s a little complicated as to why this is necessary, but just trust me on this one. Click on download, that’ll bring you to your browser and go to the lame download page. For some reason they haven’t updated this, so you click on there and then go to Windows downloads and you can select the exe or the zip file. I selected the zip file for my case but either one works. And as you can see the contents of the zip file are these three files, this DLL is the one you want. I copied it right over into here. It doesn’t matter where you copy it as long as you know where it is. And then going back to Audacity, we simply point Audacity to the DLL that we saved and then you hit OK.
And now we’ve saved our MP3. So you can bring up the location of where you saved it and have a listen. And that was my recording. So that’s the quick, short view of how to record an MP3 with Audacity. Here’s how I transcribed the video. It’s a lot easier than typing everything. You just need a Google account and an Android smartphone with the Google Docs app installed. An iPhone would probably work too. Open up a new Google Docs document in your computer’s web browser. Open this same file on your smartphone using the Docs app. Hit the microphone icon to the left of the spacebar on the keyboard. As the video plays, you’ll see the transcription appear in your web browser. Once it’s done, correct the mistakes.